At the start of my most recent chemo week, I looked ahead at the schedule. On Monday, my husband would be leaving for a four-day conference on the other side of the country. On Tuesday, I would start chemo. This meant that my husband would be gone from Monday through late Thursday, and I would be home but physically and emotionally unavailable to the kids from Tuesday through Thursday or Friday (depending on how the week went). Fortunately, we have a fabulous au pair, but my kids are at an age where they simply cannot go for 3-4 days without at least one parent on board, especially when one is sick. Their emotional bank risked being drained. Alarm bells ringing in my head, I alerted the school and tutors. While they are all fabulous, none are or should expected to be a parent figure, but I knew they would do what they could. So, on Monday, off goes my husband to his conference. On Tuesday, off I go to chemo. As chemo weeks go, my treatment proceeded smoothly. Well, other than one glitch: I showed up at Dana Farber only to learn that I wasn’t actually scheduled for chemo. Part of me wanted to say “Great!” and run home, but I stayed put and they managed to find a slot for me. Then I went home with my little “to go” bag of chemo pumping itself into my port, and I planted myself in my bed for the next few days. Monday, Tuesday and Wednesday seemed to go fine. Everyone got to their scheduled classes, homework was completed and outside activities were attended. However, on Thursday, one of the boys got into “trouble” at school. He works hard to appropriately manage his energy during the school day, but on that Thursday, he had few inner resources remaining to control his giggles. His behavior disrupted the class and needed to be addressed. We were grateful that the school handled it well, but, especially because he works hard on this, he felt horrible about himself and his life on many levels. He felt like he failed. Although I tried (pathetically, from my bed and hooked to a tube) to tell him it was okay, this was a tough week and at least it was the giggles and not something really bad, he accepted no excuses for his behavior. Shortly after that, our other son tearfully told me that he still hopes that I will be healed but he now feels like this is it, this is how life will be: Treatments where I am in bed, days where I lounge around recovering, and then some good days, only to be followed by treatments again. On the plus side, his comments opened the door for us to talk about many aspects of his feelings. For example, he wondered aloud, might it be easier if I just died, because then all our suffering would be done and maybe we could all move on? (I have felt that way many times.) He asked about God and why he would let this happen. He didn’t know how he could continue to handle the stress of living with all this. I get it. While I am glad that he was able to access and articulate his thoughts and feelings, this was one of the most difficult conversations I have had in my life. I wanted to be fully present for him at the same time that I just wanted to be anywhere else. But he was in a deep hole and it was awful for him and I needed to be there for him in any way that I could, no matter how crappy and inept I felt. So, there we were. The kids were unraveling in their own ways, and I was not feeling like myself (to say the least) and unable to support them. My husband arrived home late Thursday night, and we all started to rebuild the pieces of our lives. Slowly, one step at a time. By then, I was finally unhooked from chemo and had a long shower. We were back together as a family. We could move forward. Luckily, my physical recovery was faster than usual and we were able to have friends visit on Saturday and Sunday. The normalcy of their presence halted our spiraling, provided healing, and brought us back to day-to-day life. One step at a time, we regained our footing and our daily dynamic returned to what it was, slightly shifting in ways only visible (I think) to ourselves. I hope this experience helps the boys to be resilient in some way, but we are in the middle of the journey, so it is hard to know exactly where this will lead. We are grateful to be doing this together and to have family and friends who are in this with us, who keep us heading down the path of light and joy and grounding and love. Thank you. A friend told me about an icon with myrrh streaming* to be shared at a local Greek Orthodox church at 8 a.m on Saturday. She explained that they first have a religious service, then share the oil. I didn’t hesitate to put it in my calendar. Never having been to a Greek Orthodox service, or even heard of “myrrh-streaming,” I did not know what to expect, how to act or dress or anything. But I walked through the door and the kind demeanor of the nice young man selling candles in the entry hall immediately made me comfortable. I entered the church and took stock. Most people were standing. The pews were arranged two deep around the perimeter of the room. Each one accommodated 5-6 adults and there were maybe 20 of them in total. Not a lot of seating so I’d better grab one now. I sat at the end of a pew in the back nearest the door. The main sound was the harmony of three men beautifully singing praises. I tried to lose myself in their music, but I felt restless inside and couldn’t seem to ground myself. So I decided to look around and learn. Compared to the churches and synagogues I am used to, this church was small. It had a high ceiling with wooden beams, icons on the wall and on stands, and tall narrow windows, feeling a bit like a modern European church. In the front of the room stood an ornate wall with a door in the center, through which priests would periodically walk. When I caught a peek through it, I could see movement and action behind the wall as if they were performing the religious rituals of the service, but I guess it wasn’t meant for the congregation to overtly witness. I noticed that whenever the name of Jesus or the Holy Spirit was mentioned, everyone made the Sign of the Cross, and that it was “backwards” from the way I was taught. Also, when they did it, they held their fingers in a particular pointed way. To be respectful, I tried to imitate their form and practice, though I didn’t keep up with all the crossing. Over time, the room slowly filled, and about 45 minutes after I arrived, a grandmother (age 82), her daughter (around my age) and her teenage granddaughter caught my eye. It looked like the daughter was searching for a seat for her mother. I motioned to the daughter that they could sit with me, and they did. After awhile I started talking with daughter, who asked me lots of questions like, “What is the line for?” and “Do you know what is going on here?” I learned that they were Catholic, her mother was recently diagnosed with stage 4 esophageal cancer, and they drove for two hours to come here. I learned that they were Italian and her mother is from Italy, not far from where my mother is from. I shared that I also was diagnosed with stage 4 cancer, and because I was having a really great-feeling day and I had lots of energy, she looked shocked. (That is always gratifying, that I can still pull off looking normal!) We talked about Dana Farber and treatments and faith. “My mother’s faith is rock solid.” We looked over at her mother, deep in prayer. She poked at her mom. “Don’t bother her!” I said. We laughed and she continued to talk to me. I can relate to that. I’ve been in that place. I knew that she would find her own way out, and we talked a little about it. My position (which I shared with her) is that it doesn’t matter if you can feel it – God and all kinds of spirit beings are around you and ready to support you the moment you ask for it. We chatted off and on during the service (which was over three hours long!). We learned that the line was to see and touch “the” icon, so we eventually joined the line. She shared that she had high anxiety about what to do when she got to the icon (not unusual), so I told her to follow me and just do what I do. (I’ve been in enough of these situations, and have been observing behaviors in this room for almost three hours, so I felt comfortable.) 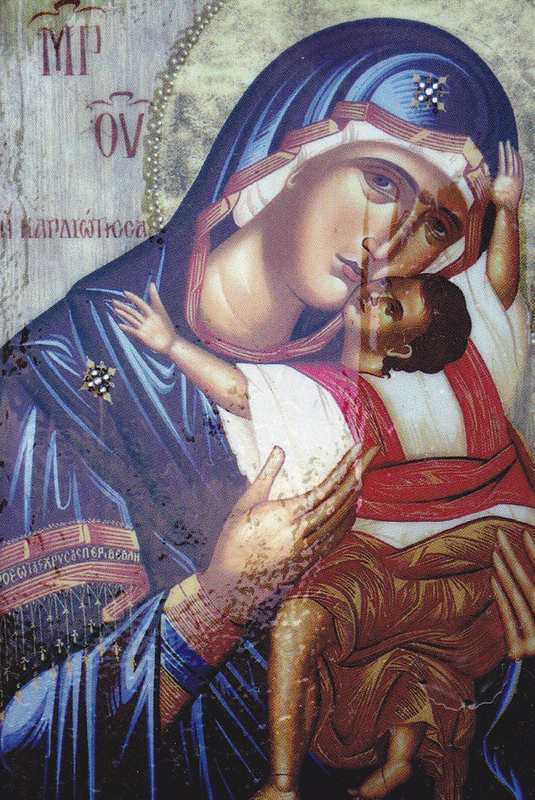 Once I reached the icon, I found myself praying for her mother and had to remind myself to pray for me too! I did get to see and smell the oil. “I’m busy,” said the grandmother. I had to laugh out loud. At 4’10” and just under 70 pounds, she was still a force. We finally reached the head of the line, where the priest rubbed the oil on our forehead and palms. Blessed, we parted ways. *For a description of myrrh streaming, you can check out this article. The icon we visited was the one from St. George’s in Tyler, PA – if you want, just skim down to the point in the article to learn more about it. They describe the service as 40 minutes – I don’t know why ours was so long. Although I like to picture myself the way I have always been, sometimes I get shocking glimpses of my body that I cannot ignore. For example, I walked by a mirror and wondered “Who is that woman with the super skinny arms?” (Yes, one can be too thin.) Or one of the kids recently asked me to go bike riding with him, and when I said yes, my husband noted that I had not been able to move from the same spot for almost three hours – was biking a realistic possibility? I don’t want to see myself like that; it just feels too limiting. Inside, I feel like the same person and I don’t like to think that my body has changed at all. In the meantime, I again experienced a series of morning sneezes. They started a few weeks ago – two or three sneezes just after waking. Usually, sneezing really hurts my abdomen but these did not. Still, they came one after another every single morning before I got out of bed. Over the weeks, they became four, then five. The other day, I counted six sneezes in a row. At sneeze number six, I finally remembered that my grandfather used to do the same thing, so I laughed and asked if this was him. The sneezing stopped. I smiled, thinking that meant he got his message across, letting me know that he was with me. A few hours later, standing in the driveway of a friend’s house, I remembered that morning and the sneezing. I laughed at myself and decided I was making too much of a coincidence. Was it really you? I asked him in my mind as I looked from the driveway to the street. As if in answer, a landscaping truck drove by. In large letters on the side of the truck was the name of the company, which was the same as my grandfather’s last name. Okay. I can be skeptical but honestly, this stuff is such a kick! I’m glad that we remain connected to those we love, regardless of the form we each take. We all grow and change form, in one way or another. We gain and lose weight. We build muscle and lose it. We change our perspectives and beliefs. We wear fancy clothes and sweatpants. Our hair changes length, color and volume. We age. My own physical form may be changing but, like my grandfather who is no longer here in physical form, we can still connect in the ways that we are able. And it can be so much fun. Regardless of your form today – whether this is a fabulous day or you have areas where you would like to be “better” – I hope you have fun connecting with someone or something you love.